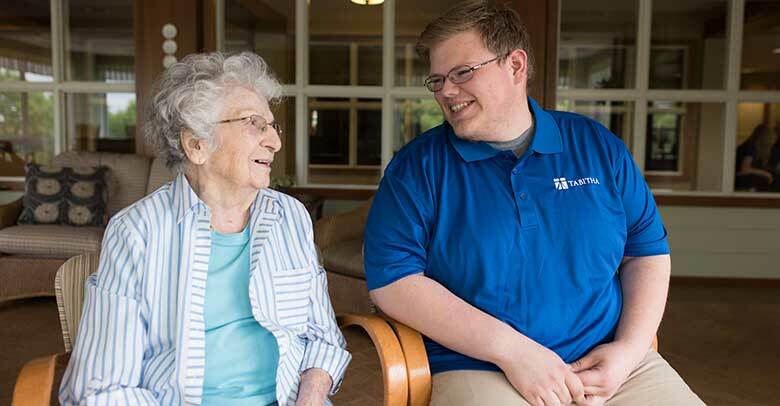 Ask any client, volunteer, donor or employee what sets nonprofit Tabitha apart from other Senior Care providers and the prevailing answer will be—“it’s the PEOPLE.” Tabitha TEAMembers are dedicated to Tabitha’s Mission of promoting dignity and independence for those they serve. As Tabitha has transformed over the years so has the Human Resource department. So much so that it’s now referred to as Talent & Culture (T&C) and not only includes the business of recruiting and retaining but mentoring and investing in the career paths of valuable employees. Every aspect of this is done through the filter of Tabitha’s Culture, which includes a clearly defined Vision, Mission and Core Values. When Katie Lechner took on the role of vice president of human resources in 2016, her team focused on a caring, service-minded philosophy and rebranded the department as ‘Talent & Culture’ to better represent the role it plays and the services it offers to the organization. Lechner shared, “We seek out candidates with the proper skillset in addition to aligning with Tabitha’s Culture and Core Values, not just bodies to fill job openings.” Lechner explains that ‘talent’ is a much more accurate descriptor of a Tabitha employee and alludes to how someone can evolve, obtaining new knowledge and skills and cultivating their career at Tabitha. In 2018 Tabitha introduced two new career-building initiatives, a Mentorship and a Workforce Development program. And to top it all off, Tabitha was voted as the runner-up in Best of Lincoln—Best Places to Work category. Check out Tabitha’s Culture and view current job listings at Tabitha.org/Careers.